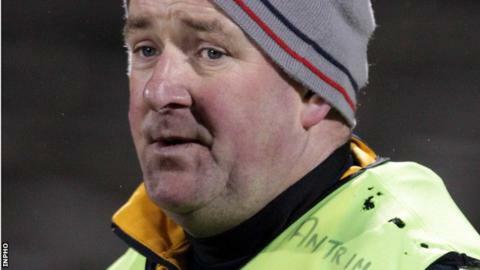 Frank Fitzsimons has been named as Antrim's new football manager just hours after Liam Bradley quit the post. Bradley's resignation on Wednesday was quickly followed by the county announcing U21 manager Fitzsimons as his successor with the senior team. Bradley was in his second stint in charge of the Saffrons but has decided to stand down after one year in charge. It is understood Bradley was unhappy that Antrim had sought club nominations for the post of manager for 2015. "We have reluctantly accepted the resignation and we place on record our thanks for all that Liam has done for us," said county chairman Jim Murray. Under Bradley in 2014, Antrim won just two matches in the league and finished two from bottom in Division Four. However, they did achieve a first Championship win in five years when they beat Fermanagh 2-18 to 3-13 to reach the Ulster semi-finals. Bradley had previously been in charge of Antrim from 2009 to 2012, taking them to the Ulster county final in his first season.